Oh my there’s a lot going on this week. As you can see by the header picture, we did a coffee cupping this week, the kids started school, the LaTeDa Mobile Boutique was here this morning, and we have a unique new coffee offering for you. Whew! First of all, as the summer is drawing to a close I realized that I never introduced our summer intern. If you’ve been here on a Tuesday morning, you might have met Ben. He came once a week to learn about roasting from Trace, with the goal of someday being in the coffee business. It is always fun to teach someone who is truly interested in your craft, and I think Trace enjoyed passing on his depth of knowledge and experience about roasting. The Balinese bag, and our board this week, courtesy of Tracie VanWicklin. 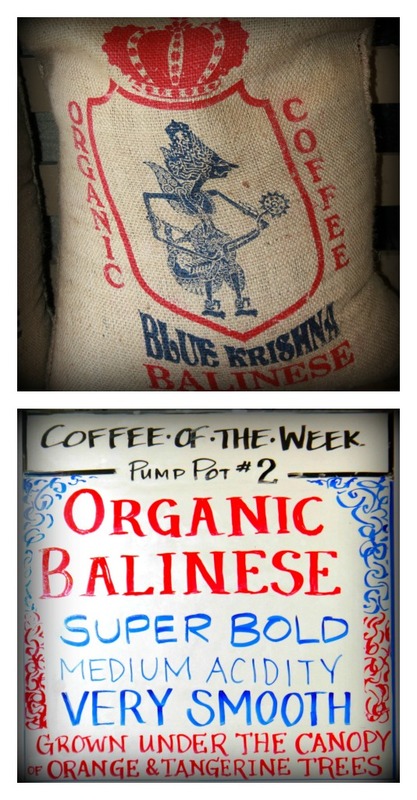 The coffee of the week is from Bali, a country we have never featured before. I know that it is beautiful there, and I love that this coffee was grown under a canopy of orange and tangerine trees–doesn’t that evoke a brilliant tropical scene in your mind? Can you picture shiny coffee bushes with their lipstick cherries sheltered under a glistening citrus tree? The taste of this bean is far from citrus: in fact, the closest coffee we’ve carried by cupping profile is the Extra Bold Sumatra that we featured in April. Since Bali lies just east of Java, and is also an Indonesian province, it’s not surprising that the two are so similar. This is also a full-bodied coffee, with a depth that lingers even as it cools. 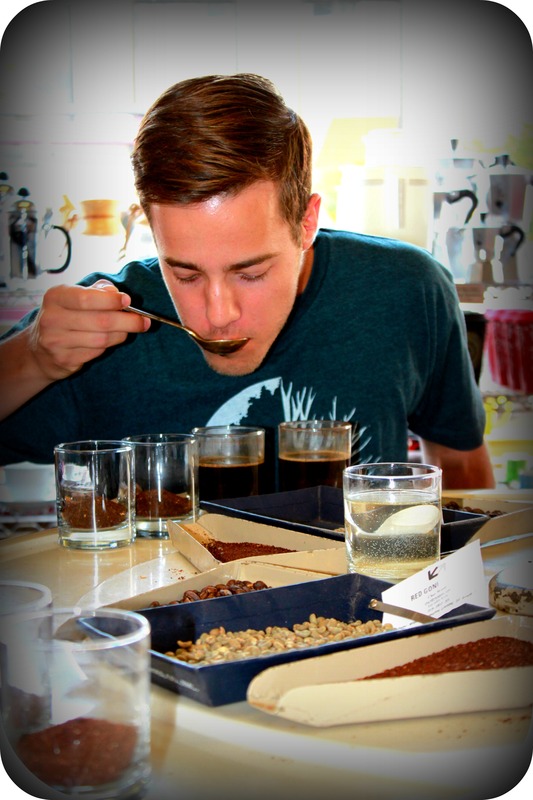 It has earthy tones, and it’s full of flavor–something we shouldn’t take for granted, as our cupping this week reminded us. Two of the varietals we cupped were pretty bland. Bali is known for tourism far more than for coffee, so I would guess that not many of you have tried this bean. You can mention the code “coffee of the week” when you stop in to try a cup on us. 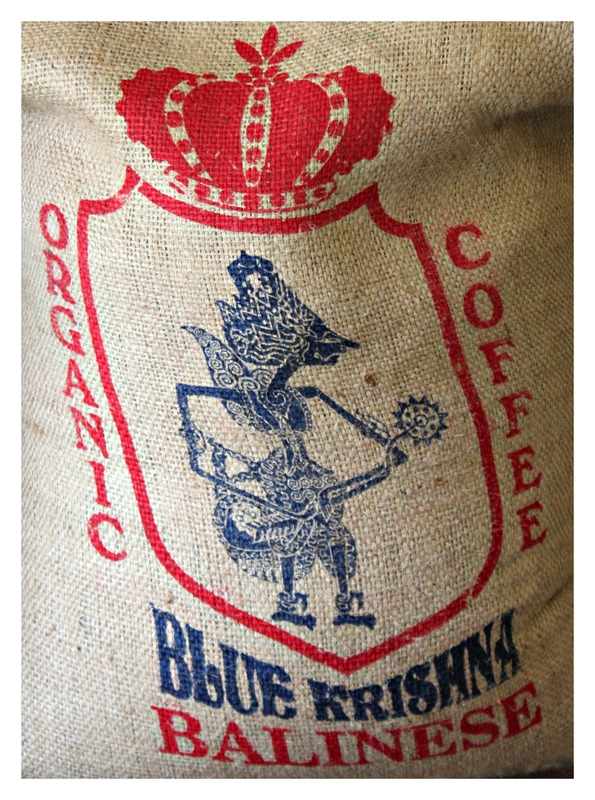 If your favorite coffee is Indonesian, come see what you think of this Balinese version. In other news, scroll down the blog to see pictures of the boutique this morning, and of a garden harvest. The tomatoes in our sandwiches are currently coming from a local farm, but we hope to have a steady supply from our own garden soon!